Banh mi? No. Banh yu! I got halfway through before I remembered to take a photo. I know I’m late on this train, but I had my first banh mi this week. How did I miss this? More importantly, how did I miss that they were available in Syracuse? I’ve been lucky enough to eat in some fine restaurants where the prices have been as flashy as the food. But, that said, some of the best culinary experiences of my life have been $10 or less. My first In-N-Out Burger (two Double-Double extra pickles, two large fries, large Coke) was a seminal moment. The first time I had clam pizza from New Haven’s Frank Pepe’s (white, no cheese) was quite an experience. A chorizo torta from Hornys Barbecue in North Las Vegas, my first NYC cart hot dog, my first raw bar trip…all were about $10. The banh mi grew fame in NYC as the next “it” food. New York magazine still throws down rose petals prior to every article on it. 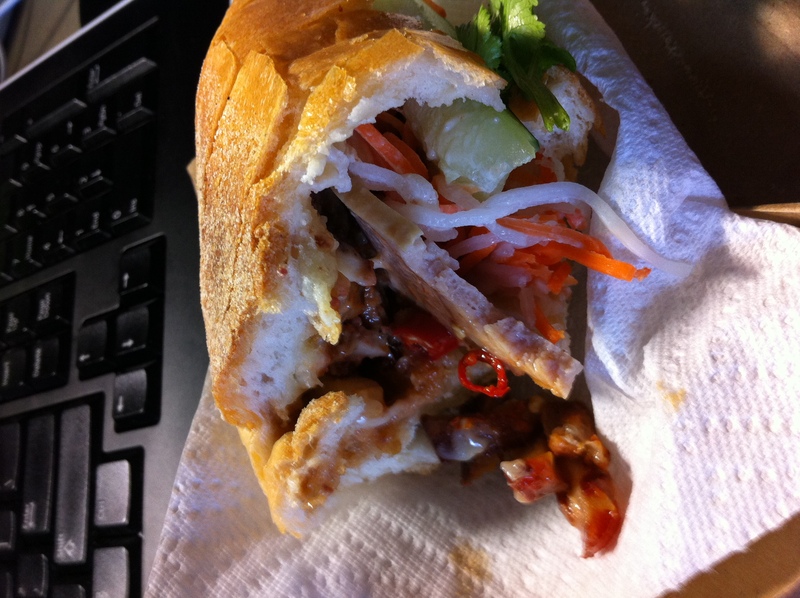 Essentially, it’s a Vietnamese hoagie. A crusty roll is lined with a whole egg mayonnaise and packed with pork belly and pate. A lineup of carrots, cucumber, cilantro and daikon–a Vietnamese radish–are added for texture and as a cooling balance for the chili peppers. The New York Times breaks it down in a graphic accompanying their ceremonial christening of the world’s greatest sandwich. A photo of a high school friend’s child chowing on one of these marvels led to a conversation that led me to Ky Duyen Cafe on the corner of North Salina and Butternut Streets on Syracuse’s North Side. This area of Syracuse was where my mother and most of that generation’s Italians grew up. From the 1920s to the early 1980s, this was the heart of the Italian immigrant community. It was also a strong Catholic enclave. It’s no surprise that my mother’s childhood home was on Mary Street, within walking distance of Our Lady of Pompeii church. A short drive Northwest to Salina Street brought Assumption Church, while a trip Southwest would bring you to St. John the Evangelist and St. Joseph’s Hospital, founded by the Franciscan Sisters of Mercy — the site of The Child’s June birth and many of my own child and adulthood ER trips. As with most immigrant communities, the children leave for suburban homesteads, leaving the parents to mind the fort. Mary Street took an ugly turn during the 1980s, forcing my aunt to move her and my grandmother to a safer area of the city. No old school Italian will ever say it outside of family, but at family dinners you would hear how it was a sin that the area was taken over by “them.” There was no specific “them” being referenced. It was basically any ethnic group that was not Italian. It could have been a group of Irish families that moved in and it still would have been a sin for “them” to be there. It didn’t make things any better that “they” were a little darker than your average Italian. The North Side became a community of poor whites who could not afford the suburban flight, poor blacks, and a community of Asian immigrants, specifically Vietnamese, Hmongs and Cambodians. St. John the Evangelist is home to the city’s Asian Apostate. Butternut, Salina, State and all of the other nearby streets are dotted with Asian groceries and small restaurants. The best pho in the city is served at New Century Vietnamese Restaurant on Kirkpatrick Street, not at the University-area Vietnamese storefront. And, the best (and only one of note) banh mi in town is served at the corner of Butternut and North Salina. Ky Duyen has all of the ambiance of a crack house. A few of the exterior windows have been shot at (nice!) and the front door has a curtain over it, giving you pause before you enter. The dining room has a disco ball, two large screen TVs and DJ equipment pumping Vietnamese music through the room. At the counter are a collection of regulars, none of which are named Norm, as well as a PC and a box of Vietnamese CDs and DVDs for sale. The owner, Dung Vu, was yelling at someone on a cell phone in what was likely Vietnamese. It should be noted that the extent of my Vietnamese is “banh mi” and “pho,” so I’m not entirely sure what was tying her up on the phone. Nonetheless, you wait for the boss to make your sandwich. A short man wearing a green engineer’s hat, started holding up numbers with his fingers. 1. 2. 3. 4. It took a second before I replied with my right index finger. He barked some combination of syllables and the boss put my roll in the toaster. Cigarette smoke filled the room, making for an odd smell in smoke-free-restaurant New York State. When the bell on the toaster rang, out came the football, which was sliced and coated with Vu’s “special butter,” a whole egg mayonnaise cut with butter. A heaping spoonful of minced pork and sausage was added from a steam tray and followed by a piece of pork liver pate. Pickled carrot and daikon were next, followed hot peppers, a cucumber spear and a generous handful of cilantro. The sandwich goes on a paper towel, in a brown paper bag and traded for a $5. My $1.50 in change came quickly from the engineer hat, who did a better job counting the change than some of the English-speaking kids who mind the registers at Wegmans. The sandwich was everything that you’d hope for. A little spicy. A little salty. A little rich. And, a hell of a story. Syracuse.com featured a story in April 2010 on Ky Duyen that I totally missed. I love how you really get into the restaurant experience and the food. You don’t question or judge the restaurant you just get right into the food, and I think that is the only real way to enjoy food. I feel the same way. I try to embrace the experience whenever I go to a restaurant.